Across the nation, tribal languages are vanishing at an alarming rate, taking with them a vital piece of culture. While the Montana legislature has taken steps to preserve and promote tribal languages in the state, the legislature should make funding for the Montana Indian Language Preservation Program (MILP) and language immersion programs permanent, rather than one-time-only. These programs are an important step forward in improving student outcomes, strengthening communities, and preserving culture, language, and history in Montana. 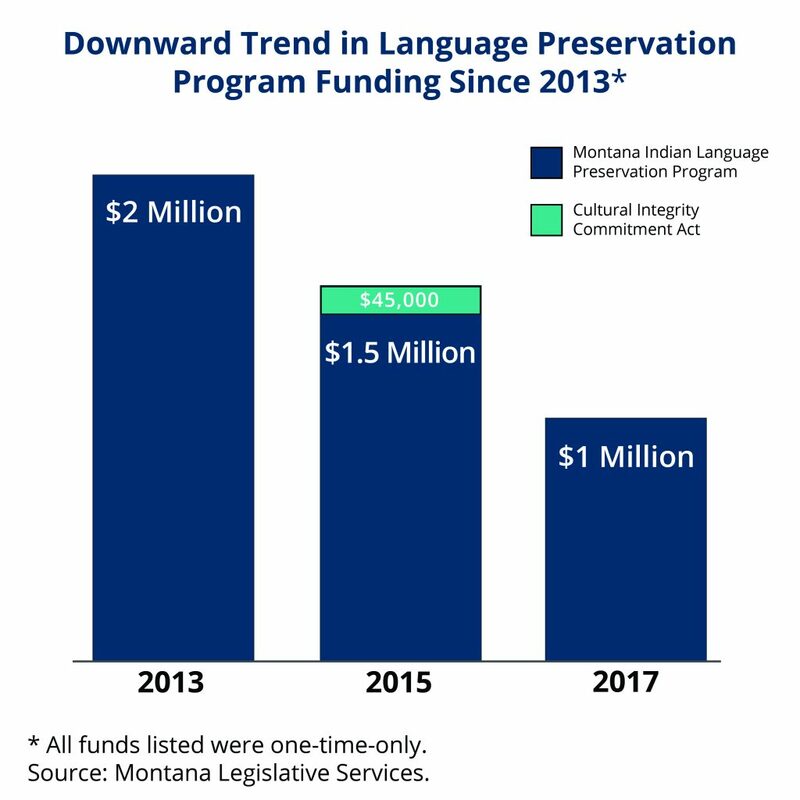 In 2013, the Montana Legislature established the Montana Indian Language Preservation Pilot Program, providing $2 million to support language preservation efforts by tribal governments. The Legislature extended the program in 2015 with $1.5 million and in 2017. However, by 2017, the Legislature had reduced funding to $1 million. In 2015, the Legislature enacted the Cultural Integrity Commitment Act (SB 272) to encourage school districts to create language immersion programs on their campuses. The act provided a one-time-only appropriation of $45,000 through the 2017 biennium for Indian language immersion programs in schools with American Indian student enrollment of at least 10 percent., The program made Montana the first state after Hawaii to fund tribal language immersion in public schools. Without further action by the Legislature, funding for both MILP and the language immersion programs will end in 2019. These programs have helped curb the trend in tribal language loss by spurring the creation of language education courses, dictionaries, sound books, and Montana tribal nations language apps, as well as by increasing school districts’ capacity. As a result, all Montanans now have greater access to tribal languages. In order to continue to build on the successes of this program and curb further loss of tribal languages, the Legislature should adequately invest in MILP in the 2019 legislative session. Of the more than 300 tribal languages once spoken in the United States, only 175 remain. If no action is taken, experts estimate that by 2050, no more than 20 will be spoken. Montana is home to nine of these languages. Assiniboine, Gros Ventre, and Montana Salish are critically endangered, meaning “the youngest speakers are grandparents and older, and they speak the language partially and infrequently.” This is an issue because languages that are not spoken by children are at great risk of becoming extinct, or of having no remaining speakers. Unlike speakers of “world” languages, such as Spanish and French, who can be found around the world, speakers of tribal languages tend to live on tribal homelands, meaning shrinking communities of speakers are not replenished. Therefore, we likely lose tribal languages forever when there are no remaining speakers on tribal homelands. When communities and schools include tribal languages as part of an academic curriculum, American Indian students benefit in a number of ways, including improved academic success, increased self-esteem and self-worth, a greater sense of cultural identity and belonging, and strengthened relationships. · Preservation of Montana culture and history. Many students in Montana stand to benefit from language immersion programs. American Indian students comprise 14 percent, or nearly 21,000, of public K-12 students in Montana, and that number is increasing. American Indian students that receive language immersion instruction perform better academically than students who do not receive language immersion instruction and also see greater retention rates. , This is important because academic performance and retention rates among American Indian students in Montana are generally lower than that of non-Indian students. For example, the Blackfoot language immersion program in Browning, Montana has benefitted students. In just its first few months, attendance in the immersion class was higher than in the non-immersion class, immersion students were performing better in math, and immersion students were gaining fluency in a second language. However, because the program received just $11,000 in funding, the number of students served was limited. Other language immersion programs have produced similar outcomes. The Navajo immersion program in Arizona, for instance, yielded greater student performance in math and English-writing and greater fluency in Navajo. Sixty-eight percent of immersion students met or exceeded math standards on state standardized tests, whereas just 15 percent of non-immersion students met or exceeded standards. In English-writing, 55 percent of immersion students met or exceeded standards; just 35 percent of non-immersion students met or exceeded standards. The program also demonstrated that language immersion instruction enhanced students’ mastery of the English language, rather than reduced it. Language-based curricula and instruction promote a strong sense of cultural identity. This is important for a number of reasons. When schools include tribal language in the curriculum, students tend to have increased self-esteem, experience less anxiety, and show a greater level of self-efficacy, which then impacts the likelihood of substance abuse and suicide risk among students. In fact, American Indian youth who have a stronger sense of cultural identity and knowledge of tribal language are less likely to fall into drug and alcohol abuse,, more likely better able to cope with stress, and less likely to have suicidal thoughts. Given the high suicide rates among American Indian youth in Montana, language preservation could be considered one of the tools used to address the issue. Language immersion programs impact how students relate to themselves and their environments, in part by offering unique opportunities that bring family members and members of the community into students’ learning environment. This fosters positive child-adult relationships both inside and outside of the classroom, in addition to strengthening family bonds and building community. The Blackfoot language immersion program, for example, expects parents to attend weekly meetings to better understand what students are learning in the classroom. This creates a supportive environment for students and provides the opportunity for students to practice language outside of the classroom, ultimately exposing more members of the community to the language. Continued investments in language preservation will provide the opportunity for more in-depth work toward preserving these valuable languages and will further strengthen the relationship between the State and tribes in Montana. Continue to invest in the Cultural Integrity and Commitment Act, and make funding permanent, rather than one-time-only. “The Montana Indian Language Preservation Pilot Program.” 2013-2014 State-Tribal Relations Committee. October 2014. https://leg.mt.gov/content/Committees/Interim/2013-2014/State-Tribal-Relations/MILP3%20Final%20Report3.pdf. “House Bill No. 559.” Montana Legislative Services. https://leg.mt.gov/bills/2015/BillPdf/HB0559.pdf. “House Bill No. 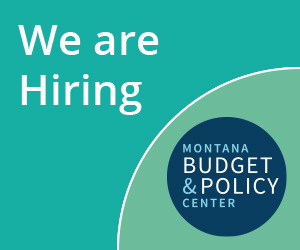 37.” Montana Legislative Services. April 18, 2017. https://leg.mt.gov/bills/2017/billhtml/HB0037.htm. “Senate Bill No. 272.” Montana Legislative Services. https://leg.mt.gov/bills/2015/sb0299/SB0272_x.pdf. Mitchell, Corey. “Montana Governor Signs Laws to Promote, Preserve Tribal Languages.” Education Week. May 7, 2015. http://blogs.edweek.org/edweek/learning-the-language/2015/05/montana_approves_laws_to_promo.html. Martin, Amy. “Montana Offers a Boost to Native Language Immersion Programs.” All Things Considered. May 2, 2015. http://www.npr.org/2015/05/02/403576800/montana-offers-a-boost-to-native-language-immersion-programs?utm_medium=RSS&utm_campaign=education. Cohen, Patricia. “Indian Tribes Go in Search of Their Lost Languages.” The New York Times. April 5, 2010. https://www.nytimes.com/2010/04/06/books/06language.html?mcubz=0. “UNESCO Atlas of the World’s Languages in Danger.” United Nations Educational, Scientific and Cultural Organization. July 5, 2017. http://www.unesco.org/languages-atlas/index.php. Crawford, James. “Endangered Native American Languages: What Is to Be Done, And Why?” The Bilingual Research Journal. 1995. https://ncela.ed.gov/files/rcd/BE021828/Endangered_Native_American.pdf. Eunice Romero Little, Mary, and Teresa L. McCarty. “Language Planning Challenges and Prospects in Native American Communities and Schools.” February 2006. https://nepc.colorado.edu/sites/default/files/Report-EPSL-0602-105-LPRU.pdf. “Montana American Indian Student Achievement Data Report, Fall 2018.” Montana Office of Public Instruction. https://leg.mt.gov/content/Committees/Interim/2017-2018/Education/Meetings/Sept-2018/AI%20Student%20Data%20Report%20Fall%202018.pdf. Demmert, Jr., William G., and John C. Towner. “A review of the research literature on the influences of culturally based education on the academic performance of Native American students.” 2003. Northwest Regional Educational Laboratory, Portland Oregon. https://eric.ed.gov/?id=ED474128. Pease-Pretty On Top, Janine. “Native American Language Immersion: Innovative Native Education for Children & Families.” October 2003. Report research supported by the W. K. Kellogg Foundation of Battle Creek, Michigan. http://www.aihec.org/our-stories/docs/NativeLangugageImmersion.pdf. Michels, Holly. “Browning kids thriving in Blackfoot language immersion program.” The Missoulian. April 17, 2016. https://missoulian.com/news/state-and-regional/browning-kids-thriving-in-blackfoot-language-immersion-program/article_b89b4f91-77c8-5a56-9a68-f88b8458d8e1.html. Reyhner, Jon. “American Indian/Alaska Native Education: An Overview.” American Indian Education. March 11, 2013. http://jan.ucc.nau.edu/jar/AIE/Ind_Ed.html. Hakuta, Kenji. "The Education of Language Minority Students." Testimony, United States Commission on Civil Rights. April 13, 2001. https://web.stanford.edu/~hakuta/www/archives/syllabi/Docs/CivilRightsCommission.htm. Lowe, John, et al. “Community Partnership to Affect Substance Abuse among Native American Adolescents,” The American Journal of Drug and Alcohol Abuse, 38:5. 2012. https://www.tandfonline.com/doi/abs/10.3109/00952990.2012.694534. Napoli, Maria, et al. “Sense of Belonging in School as a Protective Factor Against Drug Abuse Among Native American Urban Adolescents,” Journal of Social Work Practice in Addictions, vol. 3, no. 2. March 1, 2003. https://www.ncbi.nlm.nih.gov/pmc/articles/PMC3045112/. “Suicide among Racial/Ethnic Populations in the U.S.: American Indians/Alaska Natives.” Suicide Prevention Resource Center. 2013. https://www.samhsa.gov/capt/sites/default/files/resources/suicide-ethnic-populations.pdf. Tennant, E. “The ‘Eye of Awareness:’ Probing the Hidden Dimension of Bilingual Education.” In Proceedings of the Third National Research Symposium on Limited English Proficient Student Issues. 1993. Washington, DC: U.S. Department of Education: Office of Bilingual Education and Minority Language Affairs. https://ncela.ed.gov/files/rcd/BE019300/Probing_the_Hidden.pdf.